Happy Monday! I hope everyone had a nice weekend. Nothing else is quite like a grade school production of Charlie Brown's Christmas for getting in the holiday mood. We truly enjoyed the one presented by the combined efforts of the drama club, choir, and band at Nikolai's school last week. This was a fun lunch for me to make though it took me a little more time than many of my other lunches. The carving of the apple was a challenge as I am not very steady with cutting small details. The candy cane sandwiches were made with a cutter and some fruit leather cut to make stripes. A small candy cane shape was also cut into the outer covering of a babybel cheese and the cut out portion was cut into pieces to make the stripe design. This lunch was packed in a Fit and Fresh bento box, and this is the last week of school before the holidays. Main compartment: Candy cane sandwiches and babybel cheese in a silicone cup. Rice crackers. Top left: Cucumber sticks and grape tomatoes with a candy cane cupcake pick. I love both the sandwich and babybel! So festive! Yummy! Love the carving on the babybel! 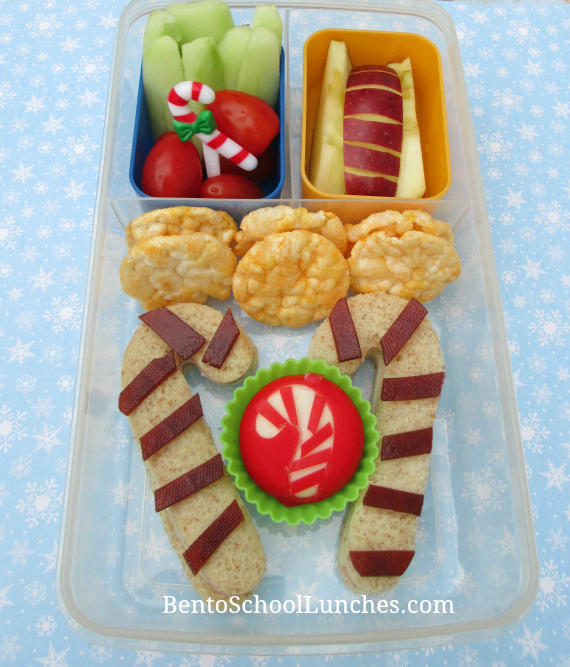 such a cute and festive bento!